Sites associated with the scheme are easily accessed from Great Eastern Highway. 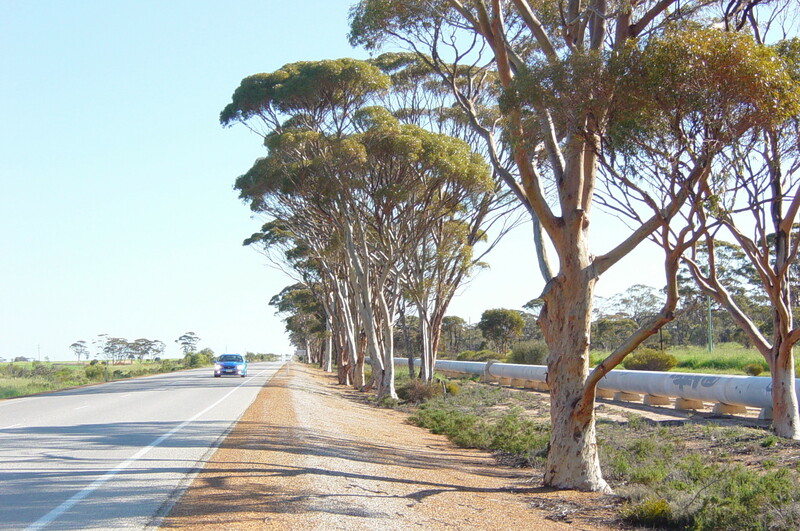 The highway grew from a track cut through the bush by prospectors rushing to find gold in Coolgardie and later Kalgoorlie. The railway line followed the route of the track and the pipeline in turn largely followed the railway line. Where a site is a distance from Great Eastern Highway and / or on an unsealed road this is noted. A drop of water leaving Mundaring Weir, the source of supply for the parched goldfields, can take one to two weeks to reach its destination. While you may not be able to spend as long on your journey, give yourself time to explore the country and pipeline history. A range of accommodation is available at various towns. Ask about local attractions at the towns you pass through. Some have dedicated Visitor Centres or you can pop into Shire Offices. Sites they recommend may increase your understanding of the dire need for a reliable water supply. Hunt’s Wells and Dams, for example, constructed in the mid 1860s, were a lifeline for prospectors who cycled, walked or rode from one to the next. Or you might be directed to a granite outcrop harvested for water prior to the pipeline being built, such as at Kellerberrin or Merredin. And Mundaring has Lake Leschenaultia built for steam trains.